Do you want a dependable and stylish SUV? The 2016 Honda CR-V is the right choice in a smaller SUV. 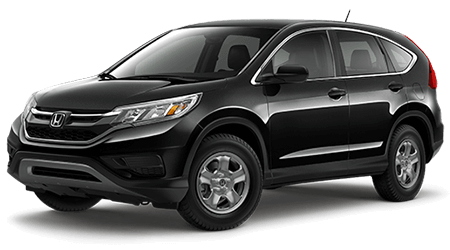 At Burns Honda of Marlton, NJ we carry a great selection of Hondas, including CR-Vs in different trim levels. Burns Honda of Marlton, New Jersey offers all of the Honda models, including the impressive 2016 Honda CR-V. We stock vehicles with a range of options and packages to suit any shopper’s tastes and budget. As one of New Jersey’s premier Honda dealers, we are proud of our history of amazing customer service along with a fantastic selection of Honda cars and SUVs. We serve Honda owners and potential Honda buyers throughout Mount Laurel, Cherry Hill and Medford from our dealership, conveniently located at 325 Route 73 in Marlton. Don’t hesitate to contact us today and set up a test drive. The stylish and reliable mid-sized 2016 Honda CR-V offers the SUV buyer great performance in all five of the available models. The peppy 2.4 liter, DOHC, 4-cylinder engine delivers 185 horsepower. That power comes along with a budget-friendly 26 mpg city and 33 mpg highway* fuel economy in front-wheel drive models and 25 mpg city/31 mpg highway* for the all-wheel drive models. The standard continuously variable transmission (CVT) with Eco Assist contributes to the great fuel economy and delivers smooth acceleration. Each CR-V model features adequate ground clearance for some off-road adventures. The CRV has a ton of room for people and gear, with roof rails make it possible to carry more stuff. You will appreciate the added security of all-wheel drive (AWD) and all-season tires even if you never go off road. On the road, the AWD system makes it easier to deal with bad weather while you drive. Overall, you will be pleased with the roominess, stability, and performance of the Honda CR-V. The CR-V includes a variety of active and passive safety features to keep driver and passengers safe, and there are additional child-safety features on all models. Many of those features are standard in all models; other features come with one or two of the CR-V models. Those standard safety features include LATCH, child safety locks, anti-lock brakes, front airbags, and side-curtain airbags. Drive Assist technology helps the driver of select CR-V models stay on the road and out of trouble. Check the detailed specifications to find out what models have what features. Advanced construction techniques make the CR-V body tough, and safe. The wide variety of standard and optional safety features on different models make the CR-V a safe and secure vehicle that doesn’t cost a fortune. Regardless of the model or the road conditions, the CR-V will keep you safe and secure. The comfortable Honda CR-V exemplifies Honda engineering and design skill; it offers a safe and comfortable driving experience and a pleasing environment for passengers. If you want a stylish and reliable mid-sized SUV that’s packed with features, the CR-V models are worth a look. At Burns Honda, we look forward to showing you our selection of CR-V models. Come to our dealership on 325 Route 73 in Marlton, NJ and test drive a new Honda today!